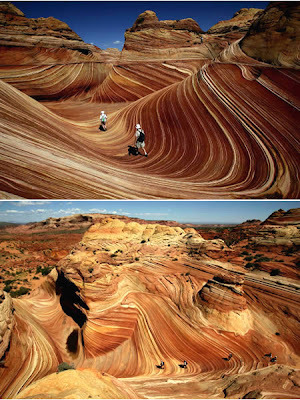 A red-rock stunner on the border of Arizona and Utah, The Wave is made of 190-million-year-old sand dunes that have turned to rock. This little-known formation is accessible only on foot via a three-mile hike and highly regulated. The Navajo name for Upper Antelope Canyon is Tse' bighanilini, which means "the place where water runs through rocks." 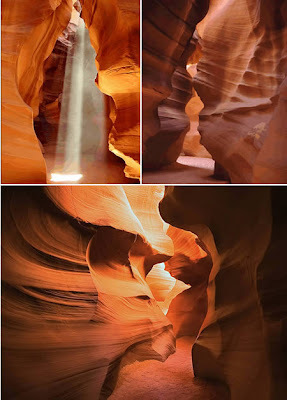 Lower Antelope Canyon is Hasdestwazi, or "spiral rock arches." Both are located within the LeChee Chapter of the Navajo Nation. Part of the Lighthouse Reef System, The Great Blue Hole lies approximately 60 miles off the mainland out of Belize City. A large, almost perfectly circular hole approximately one quarter of a mile (0.4 km) across, it’s one of the most astounding dive sites to be found anywhere on earth. 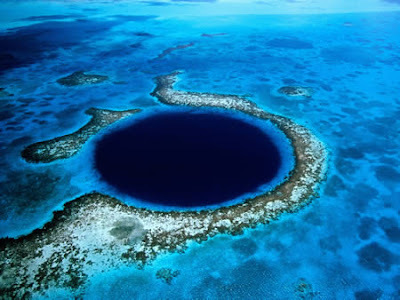 Inside this hole, the water is 480 feet (145 m) deep and it is the depth of water which gives the deep blue color that causes such structures throughout the world to be known as "blue holes." Found deep inside a mine in southern Chihuahua Mexico, these crystals were formed in a natural cave totally enclosed in bedrock. A geode full of spectacular crystals as tall as pine trees, and in some cases greater in circumference, they are a translucent gold and silver in color and come in many incredible forms and shapes. The Crystal Cave of the Giants was discovered within the same limestone body that hosts the silver-zinc-lead ore bodies exploited by the mine and it was probably dissolved by the same hydrothermal fluids that deposited the metals with the gypsum being crystallized during the waning stages of mineralization. This spectacular landform in Mauritania in the southwestern part of the Sahara desert is so huge with a diameter of 30 miles that it is visible from space. 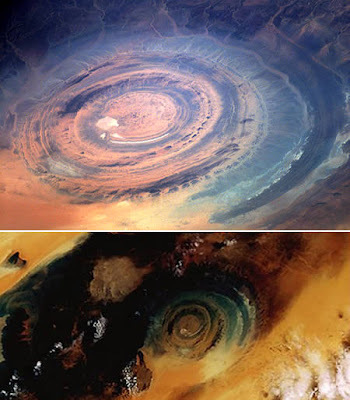 Called Richat Structure --or the Eye of the Sahara-- the The formation was originally thought to be caused by a meteorite impact but now geologists believe it is a product of uplift and erosion. The cause of its circular shape is still a mystery. 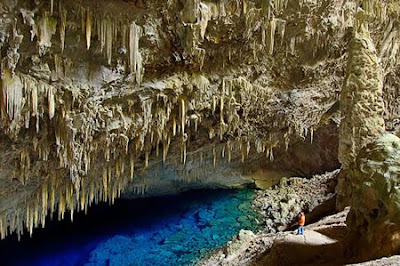 Mato Grosso do Sul region in Brazil (and especially the quiet town of Bonito) boasts many marvelous underground lakes: Gruta do Lago Azul, Gruta do Mimoso, Aquário Natural. The world famous "Gruta do Lago Azul” (Blue Lake Cave) is a natural monument whose interior is formed by stalactites, stalagmites and a huge and wonderful blue lake. The beauty of the lake is something impressive. The Blue Lake Cave has a big variety of geological formation but impresses mainly for the deep blue colored water of its inside lake. An area of about 40,000 interlocking basalt columns, the Giants Causeway is a result of an ancient volcanic eruption. 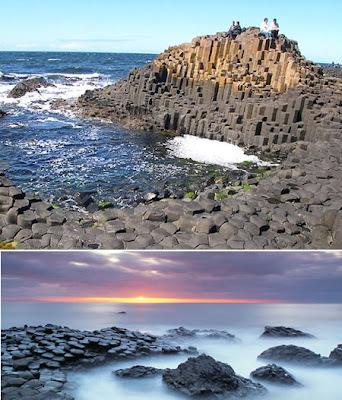 Located on the north-east coast of Northern Ireland, most of its columns are hexagonal, although there are also some with four, five, seven and eight sides. The tallest are about 12 meters (36 ft) high, and the solidified lava in the cliffs is 28 meters thick in places. In a 2005 poll of Radio Times readers, the causeway was named as the fourth greatest natural wonder in the United Kingdom. 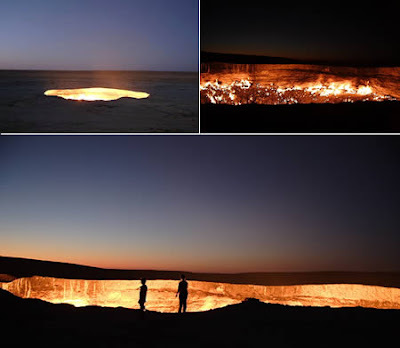 Called by locals The Door to Hell, this place in Uzbekistan is situated near the small town of Darvaz. When geologists were drilling for gas, 35 years ago, they suddenly found an underground cavern that was so big, all the drilling site with all the equipment and camps got deep deep under the ground. None dared to go down there because the cavern was filled with gas, so they ignited it so that no poisonous gas could come out of the hole, and since then, it has been burning. Nobody knows how many tons of excellent gas has been burned for all those years but it just seems to be infinite. The Wave Rock is a natural rock formation located in western Australia. It derives its name from the fact that it is shaped like a tall breaking ocean wave. The total outcrop covers several hectares; the "wave" part of the rock is about 15 meters high and approximately 110 meters long. One aspect of Wave Rock rarely shown on photographs is the retaining wall about halfway up the rock. This follows the contours and allows rainwater to be collected in a dam. It was constructed in 1951 by the Public Works Department, and such walls are common on many similar rocks in the wheatbelt. 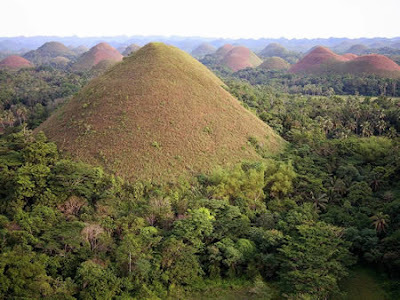 Composed of around 1,268 perfectly cone-shaped hills of about the same size spread over an area of more than 50 square kilometres (20 sq mi), this highly unusual geological formation, called Chocolate Hills, is located in Bohol, Philippines. There are a number of hypotheses regarding the formation of the hills. These include simple limestone weathering, sub-oceanic volcanism, the uplift of the seafloor and a more recent theory which maintains that as an ancient active volcano self-destructed, it spewed huge blocks of stone which were then covered with limestone and later thrust forth from the ocean bed.